I couldn’t remember how long it had been, since I ran into Tara one morning at Windsor, as she pushed a stroller down George St. She reminded me last week, that the passenger in that stroller was her youngest daughter Lily, who has turned 12. Lily has a 15 year old sister Estelle, and neither girl has the slightest interest in horses. You wonder how this is possible, given the backgrounds of their parents. Tara is the daughter of Ken and Jenni Quigley, and by age 10 was hopelessly besotted with horses, as was her elder sister Vanessa. Tara concentrated on show ponies up until age 15, when the urge to go a little faster suddenly emerged. Hawkesbury trainer John Holgate was the first to provide the teenager with the right kind of horses to ride in those early track gallops. “John was a great help to me, and made sure I didn’t try to do too much too quickly”, recalled Tara. She then went to work for noted trainer and yearling breaker Robbie Horne, and looks back on those days as a great learning experience. “I’ve never seen a calmer person around horses than Robbie Horne”, said Tara last week. “He taught us to be composed and patient at all times, and to this day I follow his methods”. Around this time Tara met a young Frenchman who was in Sydney working for Randwick trainer John Nicholls. Philippe Vigouroux had been “horse mad” all his life. He gained his early experience with show jumpers, but was becoming increasingly fascinated by the majesty of the thoroughbred. When Philippe’s Australian work visa ran out, he returned to his native France, where he landed a job on a stud farm in Normandy, preparing yearlings for the famous Deauville Sales. Tara followed him over, and she was lucky enough to find work in a jumping stable in the same district. Later she moved to England for a few months, where she worked with point to point horses,followed by a very enjoyable stint riding work for Julie Cecil, daughter of the legendary trainer Sir Henry Cecil. Tara then returned to France, where she and Philippe found work with trainer Robert Collet, at the spectacular Chantilly forest training precinct. To this day, Tara will tell you there’s no more pleasant environment in the world, in which to work horses. “Taking photos in that era was a profound inconvenience “, she reflects. “Sadly I don’t have a single photo of that fairy tale place”. Still in beautiful Chantilly, the couple went to work for expatriate Englishman John Hammond, who had a major influence on their future training methods. Hammond has trained Group 1 winners in several countries, including the famous Prix De L’Arc De Triomphe on two occasions with Montjeu and Suave Dancer. Tara and Philippe were married at a quiet ceremony in the groom’s hometown of Pradelles, in the Haute-Loire department of South Central France. When they returned to Australia they were lucky to gain positions in two high profile establishments. Tara went to Tulloch Lodge and Gai Waterhouse- Philippe to Leilani Lodge and Bart Cummings. Both were thrilled to spend time in such iconic locations, and put the finishing touches on their education. Tara and Philippe Vigouroux looked at one another one day, and exclaimed in unison “What the heck let’s give it a go!”. They set up shop at Hawkesbury, and in 1996 joined Sydney’s fairly congested commercial training ranks. One of the very first owners to patronise the stable was Helen Dalton, who had become friendly with Tara during her time at Tulloch Lodge. Unfortunately Helen wasn’t able to provide the Vigouroux stable with anything like her best horse Nothin’ Leica Dane, winner of $1.7 million dollars. Doctor George Fromberg had the distinction of owning that elusive first winner for the stable. The horse was In The Stars, a Star Of Luskin gelding, who won a Hawkesbury Maiden in June 1997, with Kevin Forrester in the saddle. Shigeru Magic Romp came to Tara in December 1998, after having won a couple of races for Colin Branthwaite. The daughter of Marauding won first up at Hawkesbury with Danny Beasley up, followed by seconds at Warwick Farm and Randwick. She finally gave her trainer that coveted first city winner, when she won a mare’s race at Canterbury with Larry Cassidy in the saddle. Soon after she won at Rosehill, ridden by Lenny Beasley. A stable favourite was J’amuse, a gelding by Jugah purchased by Philippe at an Adelaide sale. He won 4 races including an open 2 year old at Randwick, and almost $70,000. “I was riding most of our work at the time, and J’amuse was my favourite horse”, reflected Tara. “I was expecting my first child, and was aware that female track riders had to cease the practice when the 12 week mark was reached. I was dumbfounded when I received a call from the Stewards, informing me,that according to their information I was 21 weeks pregnant, and would have to stop immediately. To this day I don’t know how they got their information”. Hesperia was a wonderfully consistent Catbird mare who registered 5 wins and 13 placings for $75,000. She was raced by Ted Pratten, a long time owner, who still has horses in the Vigouroux stable. About 5 years ago, lady luck gave Tara and Philippe the cold shoulder, in a most devastating way. Philippe suffered a nasty injury, in a freakish accident at the Hawkesbury jump outs. He was riding a borrowed lead pony which “bucked” without warning, slamming Philippe hard into the saddle. He sustained a broken pelvis, and cracked a few ribs just for good measure. He took quite a while to get over it. Shortly after a horror run struck the stable, destined to have a major impact on Tara’s health. Firstly Savannah Pearl fractured a sesamoid in a barrier trial. She had to be confined after surgery, and fell foul of the dreaded laminitis. She was eventually euthanised. Rock Formation fractured a hind leg after jumping from the gates at Goulburn. He went only a few strides, and the other hind leg shattered. Around the same time, a filly called Our Whanau fractured a shoulder in the spelling paddock, after showing great promise at her only race start.. The nightmare continued when Red Eye Express fractured a leg in a race at Mudgee. With this heartbreaking sequence coming right on top of Philippe’s accident, it was little wonder Tara suffered an emotional backlash. Three years ago Tara decided to take a part time job with an organisation called Quovus which specialises in therapeutic and behaviour support. “Quovus is doing some wonderful work all over Australia, and sometimes uses horses to aid its therapeutic procedures. It’s just amazing to watch patients, patting, touching and making contact with quiet, sensible horses”, explained Tara. “You can see it doing them good”. Tara and Philippe have hosted some therapy sessions at the stables, while noted Equine Facilitated Learning Practitioner Camilla Mowbray, often hosts at her Galston property. Owners who have horses in the Vigouroux stable, should expect to travel. With country prize money at record levels, Tara and Philippe don’t care where they go to win a race for their loyal owners. Philippe carts the horses all over the state, with able assistance from good friends like his father in law Ken Quigley,Peter Marscham and Leo Andreazza. Tara’s father Ken Quigley, is a very dedicated Chairman of the Hawkesbury Race Club. In recent times they’ve raced at Goulburn, Mudgee, Cowra, Orange, Parkes, Forbes, Narromine, Wellington and Dubbo. 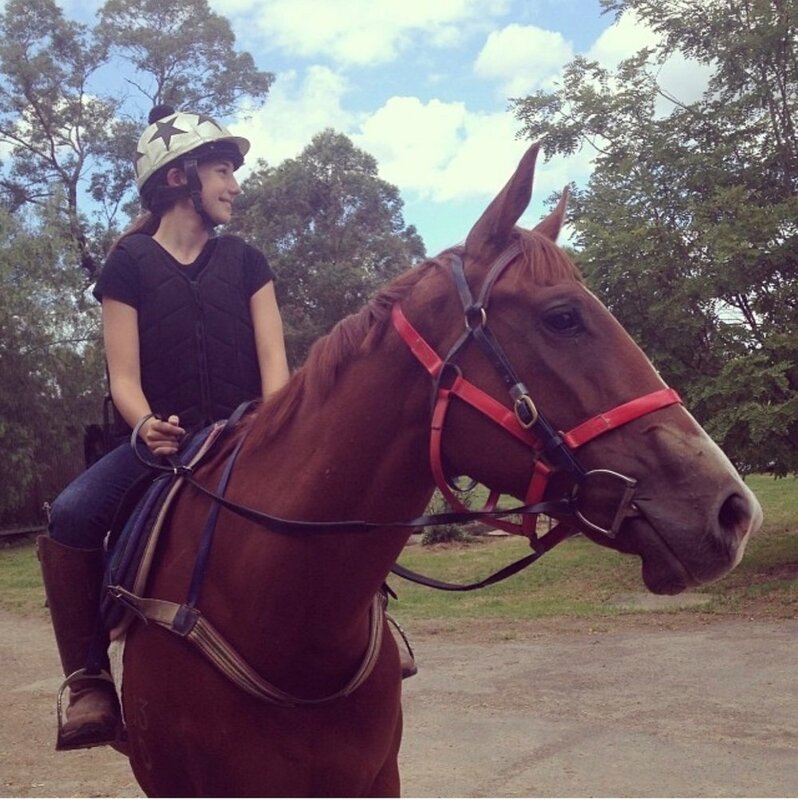 “Some of the owners have actually said how much they enjoy these trips away with their horses,” said Tara. “Just recently one of our owners commented that he’s been to places he would otherwise never have seen”. Rising 9 year old Uncle Sugar has raced extensively in the bush winning $154,000 and a Cowra Cup. Veteran mare At Twilight won $106,000 and collected a Cowra Cup and Narromine Cup . Enigami, a recent winner at Port Macquarie has won $110,000, and Azcannyaz ($98,000) has won races at Cowra and Muswellbrook. He has also run 13 seconds, accumulating good prize money along the way. “I can find my way to Randwick and Rosehill too, but I’d rather be in the bush winning decent money for our owners”, says Philippe Vigouroux”. Tara is liberal in her praise of the people who work behind the scenes. “Vanessa Medhurst and Jenny McLachlan do most of the riding, while Hayley and Chloe are valued all rounders. Janita Marscham is technically an owner, but is always there to help when we need an extra pair of hands. Jockey Claire Nutman has been a wonderful help for a long time, and the biggest accolade of all, goes to our wonderful lead pony Chimchar, who is a tireless worker”. Of her husband, Tara has this to say.” When the doom and gloom sets in as it can in all stables, Philippe has the most positive attitude. He refuses to yield to negativity, and has the amazing ability to pick everybody else up. It might only be the Frenchman in him, but it’s a quality that every racing stable should have “. When you don’t have unlimited spending power at the yearling sales, you have to do the best you can with the horses available. Tara and Philippe have the ability to quickly assess the earning potential of every horse that walks through the gate, and place them accordingly. Every now and again that means a trip to the “bush”, but it seems most of their owners don’t really mind.